The meet saw a popular and welcome return to the An Cala Bunkhouse in Lochinver after a great meet in May 2015. Getting the meet off to an early start on the Friday, Claire H ran over Suilven from Lochinver, disappearing up to her knees in clag on several occasions. After such fantastic weather on the Torridon meet a few weeks earlier, could we possibly hope for more fine weather in Lochinver? 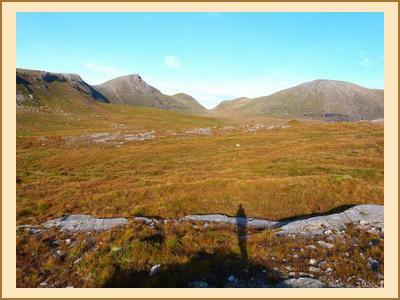 But yes, we were in luck and we awoke on Saturday morning to beautiful clear skies and spectacular views of the amazing Assynt mountains all day. 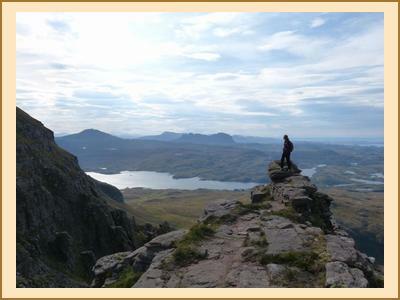 We mainly divided into two groups with Chris A, Katrina, Paul, Claire H, Keith, Jenny and Tony climbing the three Corbetts on Quinag and enjoying homemade baklava and a refreshing paddle along the way. Emma, Allan, Chris R, Rebecca and Kate headed for Ben More Assynt and Conival with Chris & Rebecca continuing down the ridge afterwards. Tim drove further north and bagged the Corbett Beinn Leoid and the two Grahams Meallan a Chuail and Meall an Fheur Loch. To round off a great day on the hills, there was a mass exodus to the famous Lochinver Pie Shop on Saturday evening where the profits must have doubled for the day with extra pies being bought to take home as well as enjoy that evening. Some of the group were lucky enough to be get amazing views of otters in the harbour at Lochinver over the weekend. On the Sunday, we headed off in various directions with Chris A & Katrina climbing the Corbett Beinn Enaiglair and the Graham Meall Doire Faid at Braemore Junction. Keith and Claire H climbed over the whole of the Stac Pollaidh ridge and Tim climbed the Corbett Bac an Eich down in Strathconon, staying dry and below the cloud throughout. Paul, Chris R, Allan and Kate headed up Canisp with unlucky timing as it clouded over just before we got to the summit and cleared again by the time we got back to the car. Emma and Rebecca enjoyed a walk on the coast at Reiff. Many thanks to everyone for another great meet at Lochinver and to Claire H as Meets Secretary for booking two cracking September meets and arranging such great weather for both.